Sure, Comic-Con is over, but the enthusiastic disparagement of Twilight doesn’t have to be. 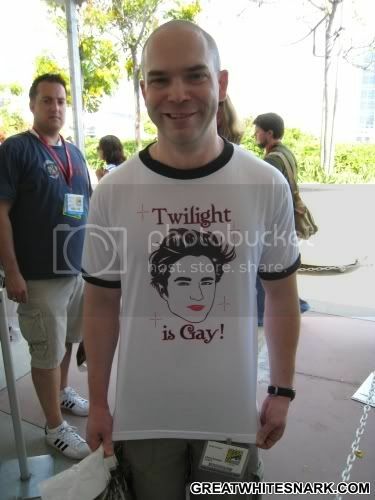 Behold the “Twilight is Gay!” t-shirt, which is not at all an exercise in homophobia, and is entirely a concise observation of objective, indisputable evidence. Evidence like overly-coiffed hair, pretty men, and body glitter. If you are a fan of spreading “information” and “facts” and missed out on snagging one of these t-shirts at Comic-Con, you can always practice the time-honored tradition of exchanging pecuniary funds for textile goods at 313Merch. Alexandra, your sadness is my sadness. Or, my mild, temporary discomfort, at the very least. Fear not. GWS is on hiatus this week, but will be back in full force on Monday.